Marvel’s X-Force reformed in recent months to unravel the mystery of Kid Cable. The younger version of X-Force’s founder and leader came back in time to force the original five X-Men to return to their own era. Along the way, he also killed the elder Cable. X-Force wants answers. They travel to a small European country where Kid Cable and Deathlok have been fighting an anti-mutant government. X-Force catches up with Cable but instead of answers, they end up with more questions. There’s time travel involved, not to mention the cyborg villain Ahab, but as the series’ first arc ends, X-Force’s greatest threat yet walks back into their lives. SPOILERS for X-Force #4 follow. Ed Brisson writes the issue, with art by Dylan Burnett, and colors by Jesus Aburtov. X-Force #4 sees the team’s final confrontation with Ahab. Ahab dies, but Cable still hasn’t found what he’s looking for. He reveals to Domino that he’s searching for Rachel Summers. Rachel is Cable’s sister from another timeline who becomes Mother Askani and raises him in the future (it’s complicated). During the Extermination event, Ahab transformed Rachel back into one of his mutant-hunting hounds and no one has seen her since then. X-Force learns that the government forced Rachel through a time portal along with several other mutant prisoners. X-Force is ready to leave and regroup, but someone familiar walks through the time portal: Cable’s evil clone, Stryfe. Stryfe has long been Cable’s archenemy and their relationship is a knot of continuity and time travel. Nathan Summers was the son of Cyclops and his wife Madelyne Pryor. Apocalypse infected the child with a technoorganic virus. He would have perished if not for the appearance of Sister Askani, a time-traveler from the future. Cyclops and Jean Grey allowed Sister Askani to take Nathan to the future, where he could receive treatment for his affliction. In the future, Mother Askani, who is later revealed to be an aged Rachel, helped raise Nathan. He became Cable, the mutant soldier who would overthrow Apocalypse. Not wanting to take any chances, Mother Askani had Nathan cloned so there would be a backup savior should Nathan fall in battle. The forces of Apocalypse kidnapped the clone believing it to be the real thing. Apocalypse raised the child, who grew to become the terrorist villain Styfe. Cable later traveled back in time to try to prevent Apocalypse from ever rising to power. Stryfe followed him back, determined to make his family - Cyclops, Jean Grey, and Cable - pay for their perceived slights against him. The events of this confrontation were the backbone of X-Cutioner’s Song, one of the biggest X-Men events of the 1990s. The event ended with the supposed death of both Cable and Stryfe, leaving the X-Men unsure of the nature of their relationship to each other. The culmination also included the release of Stryfe’s Legacy Virus, which would plague mutantkind for months to come. 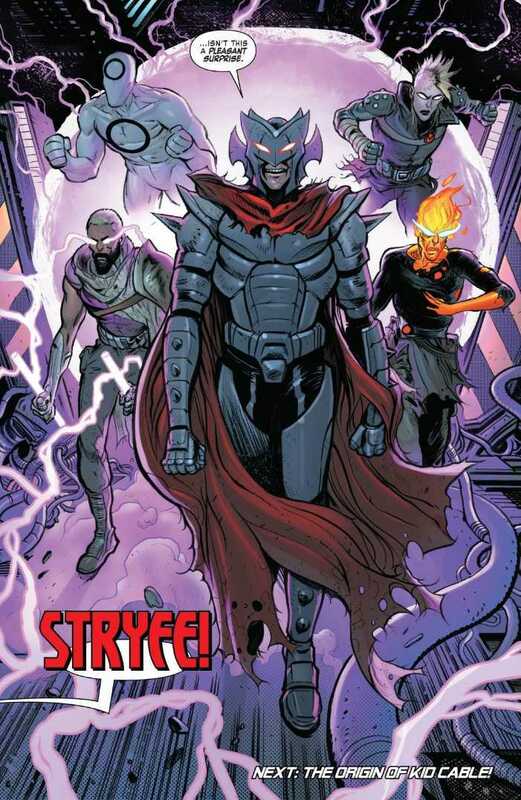 Stryfe has returned several times since these events took place. His most recent appearance was in Deadpool/Cable: Split Second, where he threatened the life of Deadpool’s daughter to coerce Deadpool into trying to kill Cable. Deadpool and Cable teamed up to defeat Styfe, rebooting much of Cable’s continuity in the process. How do you feel about Stryfe's return? Let us know in the comments. X-Force #4 is on sale now.